“NES Remix 2 is a love letter to the heavy hitting classic Nintendo titles from yesteryear.” Read the full review to find out why we’re so fond of NES Remix 2 on Wii U.
Super Mario Bros. 3. Metroid. Kirby’s Adventure. The Adventure of Link…These classic Nintendo titles no doubt mean something to you. For many, they were the first steps they took towards becoming a gamer for life. For others, they are some of the benchmark titles of the retro age, and still considered to be some of the most enjoyable videogames ever made. Whether you’ve played these games until your controller’s buttons were jammed and worn down, or these games have always been far away fantasies that you never got the opportunity to indulge in, NES Remix 2 is the perfect tool to get you excited about these classics, either for the first time, or all over again. If you’re unfamiliar with the Remix franchise (and I suppose that term is apt, since this is a sequel), the first one came out last year and gives you the opportunity to play classic NES games, boiled down to Wario Ware-ish minigames, allowing you to unlock the remixed version of the titles. This acts as a pretty effective way to introduce people to these games while also teaching them how to play them, if they’re unfamiliar. NES Remix 2 even allows you the ability to buy the full versions of all of these games through a streamlined eShop process, if you’re so taken and must have them. The age old question of “Who would win in a fight between Link and a Hammer Bro?” finally comes to head. The games at your disposal this time around are: Super Mario Bros.: The Lost Levels, Metroid, Punch-Out! !, Dr. Mario, Kirby’s Adventure, Super Mario Bros. 2, Kid Icarus, Zelda II: The Adventure of Link, Wario’s Woods, NES Open Tournament Golf, Super Mario Bros. 3, and Ice Hockey. While there are slightly less games being offered than in the first NES Remix, these are considerably better titles (no offense to Clu Clu Land). There’s also hardly a lack of content here, with the collection having over 150 levels over its 12 games, and 40 remix levels. With the previous title being released only four months ago though, it almost feels like they might have been holding off on these classic games since the inception of the series. Just hopefully they didn’t burn through too many AAA titles so the eventual next game in the series isn’t left with rejects like Shatterhand. The presentation of all of this is pretty direct; as you work your way through the minigame-esque levels of these NES hits, you’re given 1-3 stars based on the amount of lives you’ve lost, damage you’ve taken, and your speed through it all (and you’ll even get fancy glowing rainbow stars if you’re especially seasoned at blazing through these missions). These levels start off easy enough (such as something as simple as walking left and grabbing the Maru Mari Morph Ball), but become exceedingly difficult, and entertainingly frustrating (having to beat Don Flamenco, King Hippo, and Bald Bull all in one go in Punch-Out!!). As you gain stars throughout your progress, these will unlock the following levels and new games to be at your disposal, but also the remix levels (every thirty stars, more or less), which is where the game really excels. The remix levels have you playing through these classic games, with a wonderful spin on it all. These can vary from anything like playing through a level of Metroid as Toad, or being put in a level of Kirby’s Adventure without the ability to stop running forward. There’s a number of neat distracting remixes as well, like the colors constantly changing, or lights perpetually swinging, frequently casting your level in darkness. These remixes come off as such love letters to the series, and Nintendo in general, that it’s hard not to buy into these unique idea completely. For veteran gamers of these old games, there’s now finally new content available for them and clever subversions to memorized gameplay. 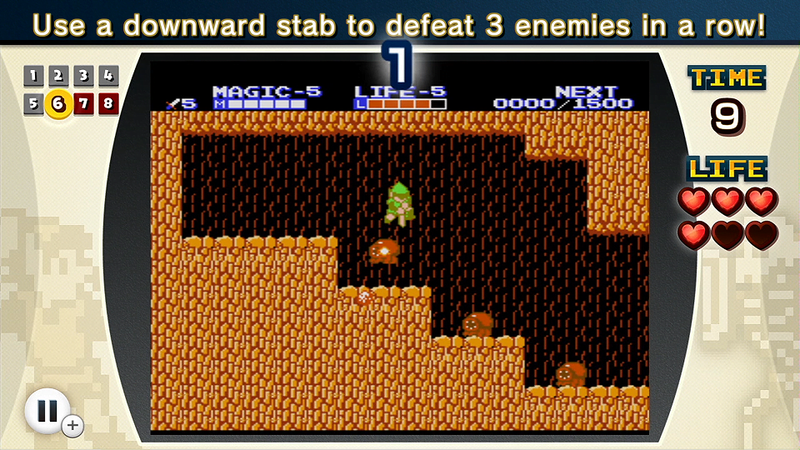 At the same time, maybe you’ve never been a Kid Icarus fan, but if you got to play a boss run mode of it as Link, you may suddenly have some interest in the series. All of these creative ideas are a delight, but some particular inventive remix challenges see you trying to rescue Princess Peach in Super Mario Bros. 3 as Princess Peach, or, blowing up blocks in the Mario-verse as Samus Aran. The universe is collapsing in on itself. Time is a flat circle. The Singularity is upon us. When it comes to the aesthetics here, you’re more or less getting what you expected. As you immerse yourself in nostalgia, you’re greeted with the same familiar 8-bit music and graphics that fit these games like gloves. The graphics are updated just so to give them that HD-compatible sheen, and in the bonus levels there’s even remixed versions of themes and music from games, which will likely bring a smile to your face. A larger concern is that a game built like this has you largely just playing the sizzle reel of these titles; the highlights. The abbreviated bursts of these games also aren’t as sensible as the ones made in the previous title, as a lot of these games are too complex to cram into 90-120 second spurts. Rather than focusing on having a roster of great games here, putting more attention in figuring out how to feature them more effectively would have been a good idea. There’s also the very obvious conclusion to jump to that a game like this would operate much better on the 3DS, with the handheld format lending itself to the grab-and-go level setup here. The game itself shouldn’t be penalized simply for no being on the “right” system though. If you happen to have a game save present on your WiiU from the original NES Remix, you’ll also gain access to Championship Mode, which is a total throwback to the old 1990 Nintendo World Championship (the original remix, featuring a mash-up of Super Mario Bros., Rad Racer, and Tetris) giving you a well designed amalgam of Super Mario Bros., Super Mario Bros. 3, and Dr. Mario. With other titles in the mix also allowing you to post your scores online, it’s nice to see that this old idea of hearty competition that was so rampant in that era is still being kept alive. That being said, online leaderboards for every title, as well as Championship Mode, wouldn’t have been asking for too much. Another very impressive bonus that’s included here is Super Luigi Bros., a full game that has you play as Luigi in a completely reversed version of Super Mario Bros., as well as acting as the final monument to the “Year of Luigi” (lest we forget). The remixes throw the perfect storm of nostalgia and OCD at you! 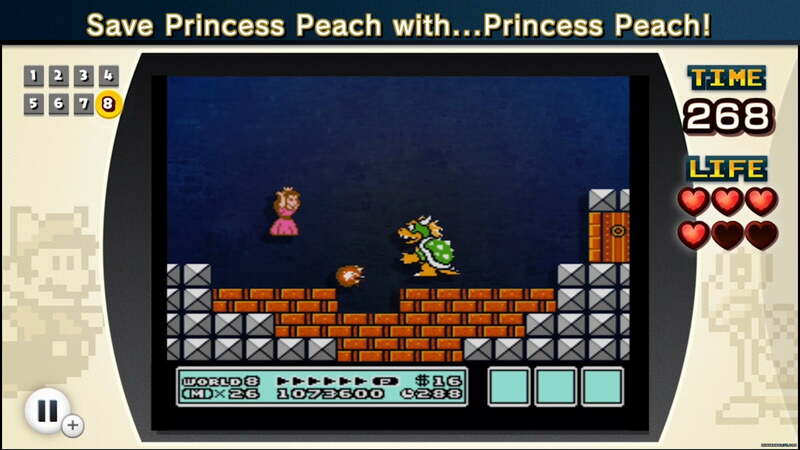 NES Remix 2 ends up coming across as a very polished second attempt at this idea, whose biggest problem is not trying to get even more insane with everything. It’s hard to see why some games like Super Mario Bros. 3 weren’t held aside for the inevitable next game, but with recent talks that the Remix franchise would like to set its sights on Super Nintendo and Gameboy Advance games, if this is the last NES installment of the series, it did them justice and went out on a high note. In the meantime, let’s try and make SNES Remix happen and go even further with it. I want to cross the finish line of Bowser’s Castle in Super Mario Kart with F-Zero’s Blue Falcon. I want to be fighting Koopa Kids in Super Mario World as Sonic the Hedgehog. I want to beat the last level of Donkey Kong Country 2 as Vectorman. Let’s blow this thing up. 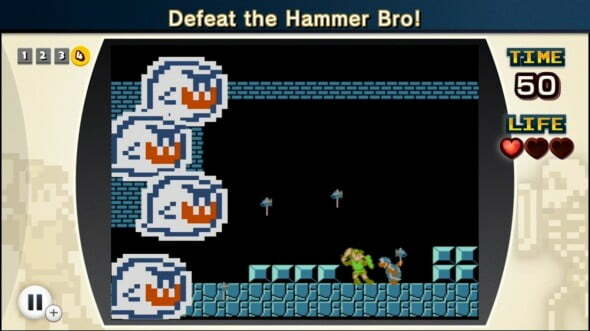 NES Remix 2 is a love letter to the heavy hitting classic Nintendo titles from yesteryear. Controls, aesthetics, and presentation are as seamless and smooth as they were over 20 years ago, and between Championship Mode, Super Luigi Bros., the bonus games, and over 150 levels of nostalgia through some of the 12 best third-generation titles, the game is not lacking in content. Granted, there are some minor design bugs and oversights (such as more robust online presence), and while some may find the game selection here not the best suited to the collection’s premise, and even manipulatively cheap to some degree, the gameplay-skewering, title-crossing, chaotic 40 remix levels will win you over and have you remembering why you loved these games in the first place.